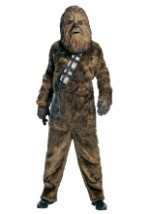 This deluxe latex Chewbacca mask will turn you into the wacky Star Wars character that everyone loves. The oversized full mask completely covers the head. The mask has multi-toned tan/brown coloring and is textured to give the appearance of real hair. Eye, nose, and mouth openings make the mask comfortable to wear all day long. A large piece of foam padding inside of mask helps to ensure a proper fit. This is an officially licensed Star Wars mask. 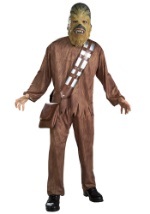 This high quality mask is a sure hit when you add Chewbacca Hands to complete your costume!